Generally, I’d like to think I’m a romantic guy. I like snuggling, holding hands, and smoochin’. But, I’m not crazy about Valentine’s Day. I like spending time with people I love (or even friends/family) on Valentine’s Day, but I’m not huge on the dozens of roses and expensive dinner situation. I told her I’d make anything she wanted for brunch last weekend as an early Valentine’s day and she chose crepes… so I made two kinds! There are so many things to love about crepes, I’m not really sure where to start. For one, you can fill them with almost anything. Second, they are pretty easy to make once you get the hang of it. Third, they actually store pretty well for later as long as you don’t fill them until you eat them! I’ve made crepes before on Macheesmo but these variations are a bit different. 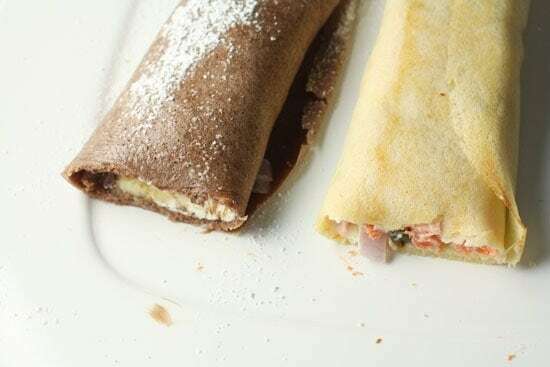 I made two different crepes for a valentine’s day brunch: One with chocolate and Nutella and one with salmon cream cheese. 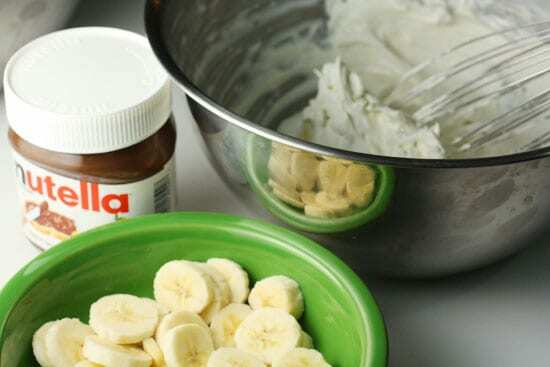 1) For the batter, mix dry ingredients and wet ingredients in separate bowls. Then slowly whisk wet ingredients into dry ingredients. Stir melted butter into the batter. 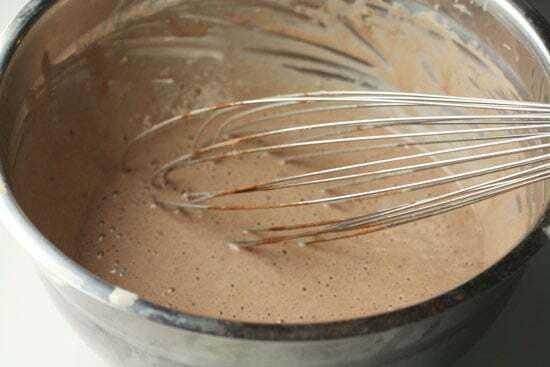 2) If you’re making a chocolate version, stir in 2 Tablespoons of cocoa powder to 1/2 of the batter. 3) To make crepes, add a dab of butter to a large skillet over medium-high heat. Once the butter is melting and bubbling, add 1/2 cup of batter right in the middle of the pan. 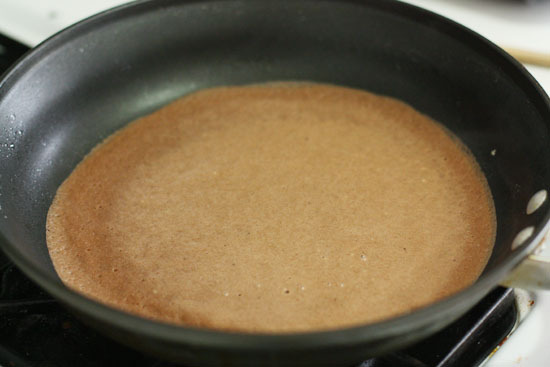 4) Swirl the pan around to spread the batter out in a thin, even layer over the whole surface. 5) Cook for one minute then flip with a spatula and cook for another minute on the second side. Crepe batter is basically like a very loose pancake batter. The only important thing to remember is to mix up the dry ingredients and wet ingredients separately. Leave the butter out until the very end. So that means combine your flour, sugar, and salt in a medium bowl and your eggs and milk in a separate bowl. 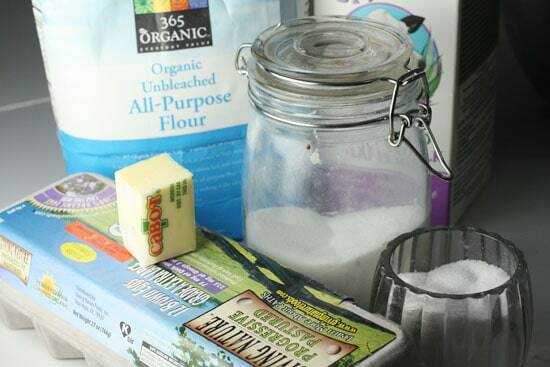 Whisk the eggs and milk together and then slowly whisk it into your dry ingredients. Last, add your melted butter. I took half of my batter and added 2 Tablespoons of unsweetened cocoa powder to it to make a delicious chocolate version! I went with two fillings for this batch of crepes: one savory and one sweet. 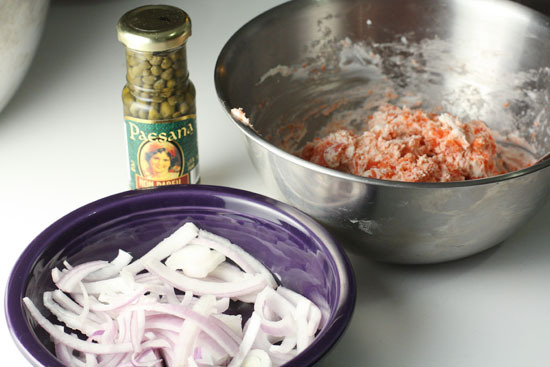 This is a really delicious savory filling. I swooned over it. You could just layer on the smoked salmon and spread on some cream cheese, but I decided to mix it all together. 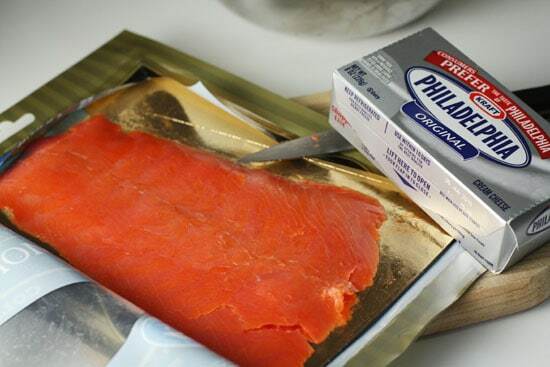 I roughly chopped my salmon and then mushed it together with the cream cheese with a fork. 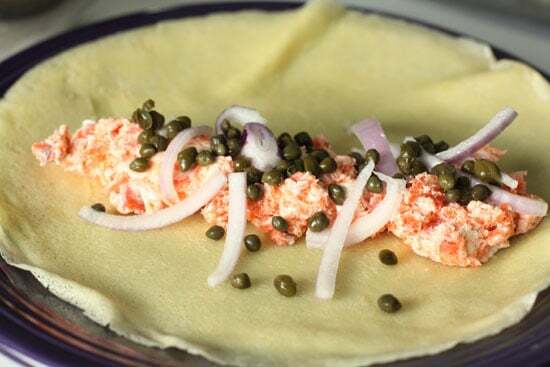 I included some classic toppings that go with smoked salmon like capers and red onions, but I didn’t mix those into the creme cheese because Betsy doesn’t like capers. Betsy requested a very specific sweet crepe (banana and Nutella). I decided to kick it up a notch by A) putting it in a chocolate crepe and B) making a creamy mascarpone filling to go with it. I actually had a bit of the cream mixture left over because it kind of makes a lot. You could half it I guess if you wanted to go light on the cream filling. 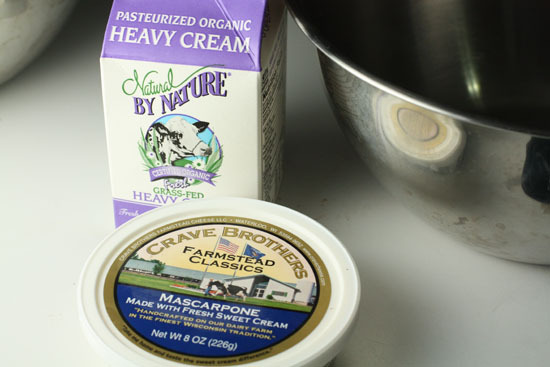 Add your mascarpone and cream into a cold bowl and whisk like crazy. You could also do this in a stand mixer if you want or with hand mixers. I went old school for this batch and just did it with a whisk. It probably took about 10 minutes and I had to stop and rest a few times! After whisking for a few minutes, add your sugar and then continue to whisk. It should be very light and hold stiff peeks. I don’t really think you need a fancy crepe pan to make crepes correctly. You just need a largish non-stick skillet. Add a dab of butter in the pan and put it over medium-high heat. Once the butter is melted and bubbling, add 1/2 cup batter, chocolate or normal to the direct middle of the pan. The important part is to immediately start swirling the pan slowly so the batter spreads out to the sides of the pan to form a thin sheet. There’s some other photos of this process on the last crepes post I did. The swirl is the important part. Cook this for about 1 minute on the first side and then gently flip it over with a spatula and cook it for another minute on the second side. If you mess up one or two, don’t worry about it. I’ve made crepes a few dozen times over the years and I’ve never gotten all of them right. Never. My rule with crepes is to fill just as many as you want to eat. It’s easier to store the crepes and filling separately if you aren’t eating them right away. Then roll them up and eat them! 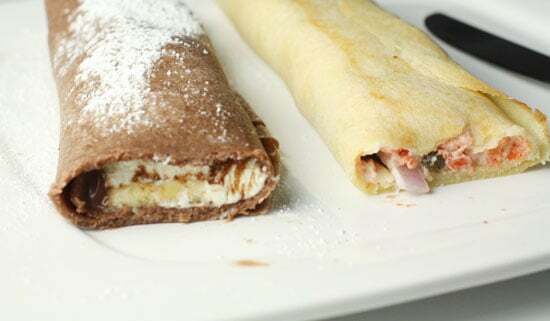 I think the chocolate ones are best right away while the crepe is slightly warm and the filling cool. For the savory version, I like to roll them up and then set them back in either a hot pan or in a 400 degree oven for a few minutes until the outside of the crepe is a bit crispy and the filling is warm. You wouldn’t want to do that to the sweet variety because the mascarpone filling would just melt all over the place. This was a good brunch! There wasn’t a lot of flowers or fuss with my Valentine’s Day brunch, but there was plenty of good food and good drinks and what more could ya want?! 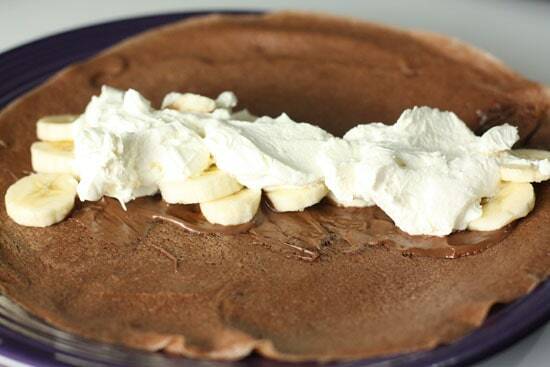 If you’re looking for something to make tomorrow with friends or lovers, consider the crepe! Happy Valentine's day to you & your girlfriend! I can’t believe I’m saying this, but those sweet crepes were even better than Doritos. As I began reading…I thought to myself, I hope he got Betsy some V-Day Doritos! You are a lucky girl Betsy!!! If the black box flight recorder is never damaged during a plane crash, why isnt the whole airplane made out of the stuff?